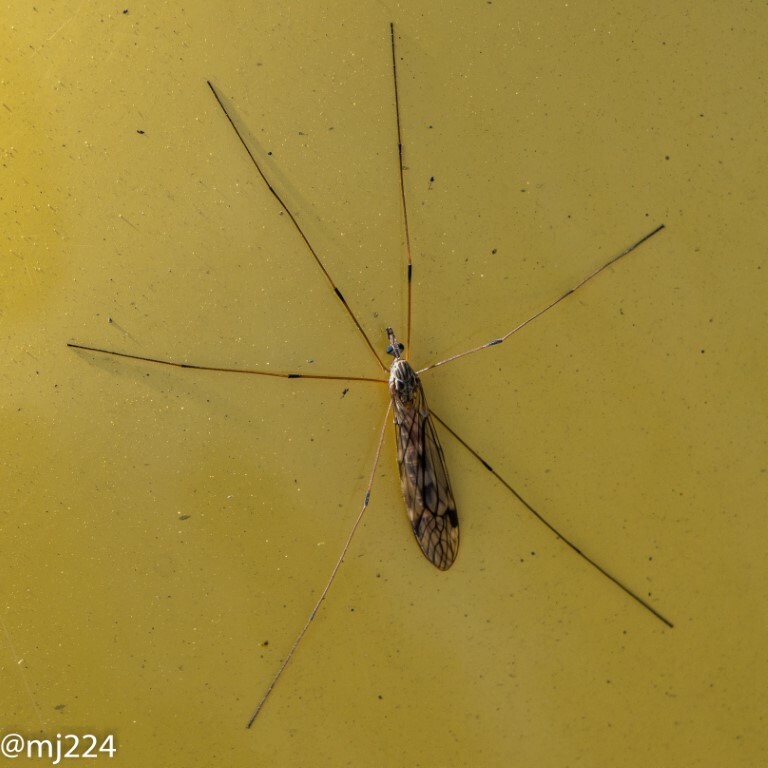 A cranefly, probably Tipula confusa. Did you find in in the autumn? http://www.dipteristsforum.org.uk/t3...g-season..html (Page slow to load). It is not unusual to find bumble bees resting, motionless, sometime on plants, sometimes elsewhere. Yesterday I prodded one which was resting on the threshold of our garage door. It flew off, clearly not pleased to be disturbed. 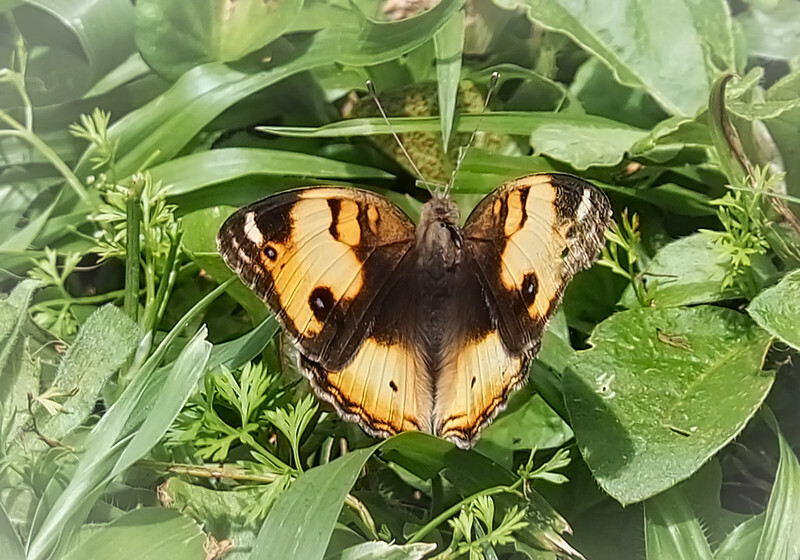 The day before, I found this one resting among Aubretia flowers, a good source of nectar. The previous day, I had taken some daylight shots of a similar, but very active, bee. With stereo pairs in mind, I though flash was essential, not least for adequate DOF. Unfortunately, yesterday I found the bee dead where I had photographed it. Ideally, the lighting should be from the same position for each frame of a stereo pair, to avoid conflicting reflections, but this was not practical. Olympus EM-1, Olympus 4/3 x2 TC, Olympus 4/3 50mm f2 macro, 1/250 f13, twin flash, hand-held. I am not at all jealous that you have over 500 species of butterfly in kenya good luck to you. And there is a butterfly centre in Nairobi (or was) which will give you some easy practice. If you were looking for other suggestions just ask. 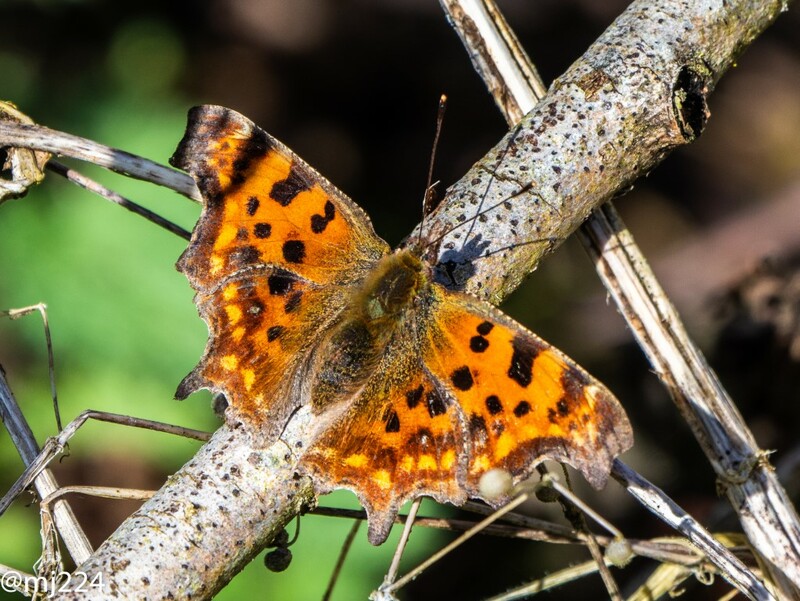 Just one of our UK butterflies. I'm just excited that the sun has found its hat and is threatening to wear it today.... So hoping for Orange Tips and Speckled Woods on top of the over wintering tough guys. Nice shot, although I think turning down the brightness would render the colours better. Thank you Harold, If I set the EV to low, would that work? I guess I will have to try. We are at 6,000 feet and the light is bright. I will have to compensate. And I ought to arrange a visit. I have seen different butterflies in the garden and down at the coast. They look so delicate and pretty. I didn’t know where to look for them in the forest or the garden, places they like to rest. 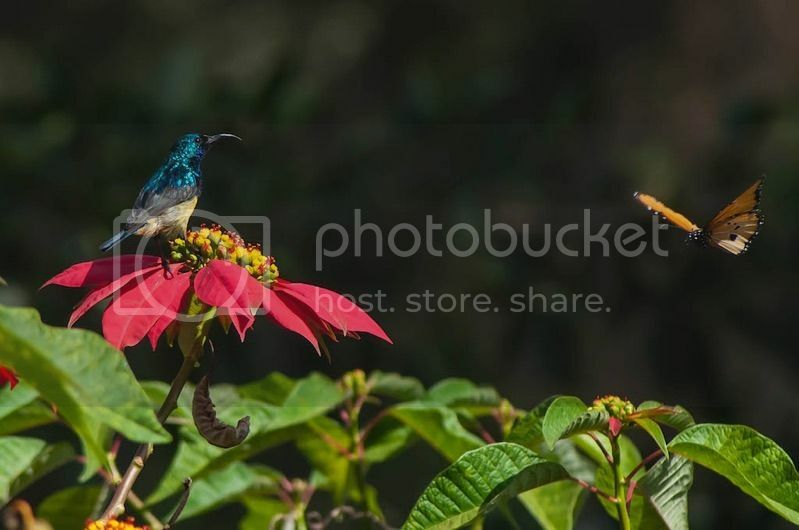 Thank you for your insights and suggestions, you have given me some ideas to try and Harold has given me useful tips about technique Here is photo of a Monarch and Sunbird on the Poinsettia in the garden, which was a one off and I have been able to get that shot again. I have seen different butterflies in the garden and down at the coast. They look so delicate and pretty. I didn’t know where to look for them in the forest or the garden, places they like to rest. Phil. The sunbird on it's own would be a wonderful sight but the gliding Monarch makes the shot. Wonderful. Love to see more. I have never ventured to Africa so I can only pass on the word of my good friend who has travelled far and wide as a naturalist and loves Africa. He would suggest you need to get to fertile areas around water. 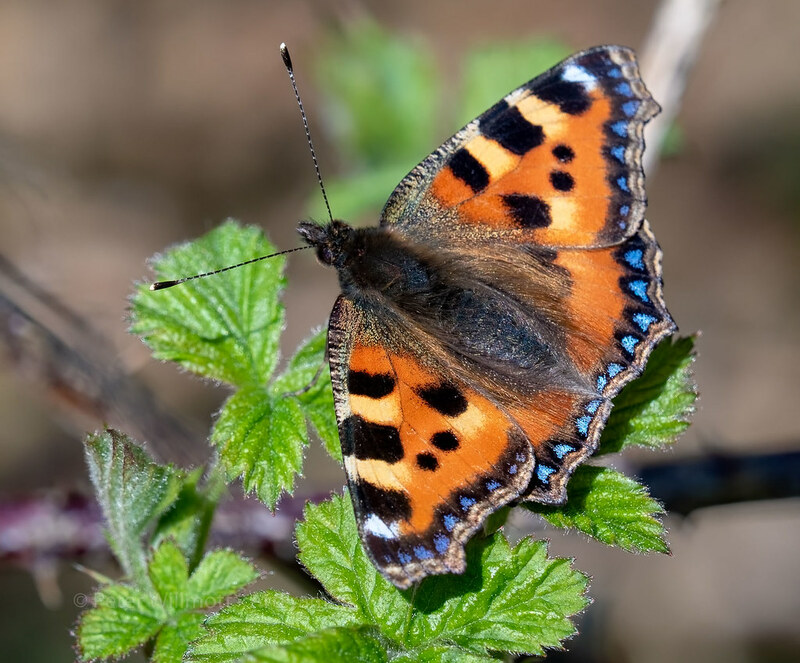 Insects will be plentiful where there is something to feed on (flowers, sap from trees, dung and rotting things.... ) and the right plants for them to breed and lay eggs on etc. With the heat then water is a magnet. He took pictures last time of a cloud of assorted butterflies at a water hole. The sheer numbers were breathtaking. I must see if I can prize a copy from him. It was taken on an em5.